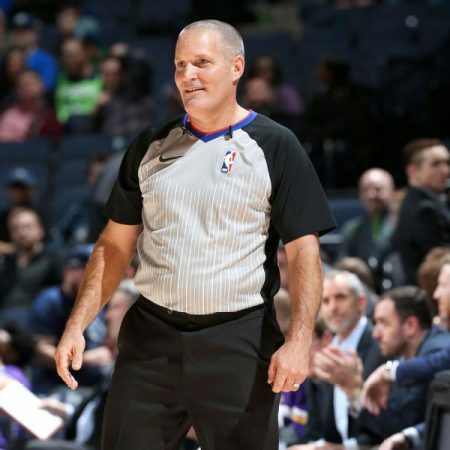 Today we're continuing our series for new officials with the switching in 2-person mechanics that occurs between the two officials when a non-shooting foul is called. We are going to learn directly from the National Federation of High School (NFHS) Officials Manual (the mechanics manual) and discuss exactly what the NFHS says about handling of switching on a foul. We will include switching all non-shooting foul & long switch. We're teaching directly from the officials manual and going from there. The non-ruling official needs to at a minimum freeze their vision and observe all ten players while the calling official goes to the reporting area to report the foul. Before we move on to examples let's just go over the principle of boxing in. When working two-person mechanics it is essential in order to keep vision on players at all times to use the boxing in principle. 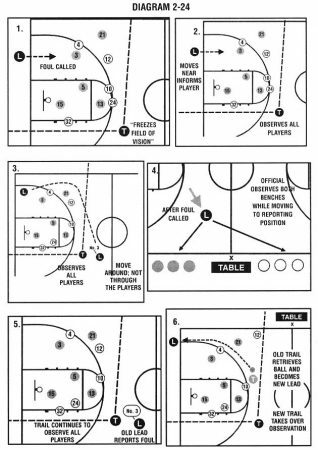 In the following examples let's make sure that we notice when officials are achieving this and when they are not and identify in your own game situations where you have taken eyes off players. Identify those situations and constantly work to eliminate them. The ability to keep eyes on players during deadball periods is a characteristic of a great official. Eliminating situations where we don't have eyes on players is a habit. It's a habit that you need to work on reinforce and make sure is a positive aspect of your game. Trail calls a foul in this instance what are we going to do we're going to switch! Trail is going to go to the table to report the non-ruling official is responsible for observing all the players and forcing the switch. In this instance the off-ball official moves to the new throw in spot note the movement of the officials how we get boxing in they move in tandem around the players. Is it perfect? no, but it's habitual II a great thing to do the Trail calls a foul in this instance what are we going to do we're going to switch on this play the Trail is pretty quick to turn away from the action the new lead is looking at the ball our observation of players is not ideal but once the calling official reports our boxing in action is very good on this play everybody knows what's going on the players know where the throw in spot is the coaches know officials are moving to position themselves and we're ready to play promptly foul is called with a sideline throw in. What time is it boys and girls? it's time to switch! Very important on this play to watch the lead he makes an attempt to grab the ball but realizing he can't get it he ignores the ball and that's a really critical thing to do as the off ball official you have to understand you what your your job is and that is to observe players. You have to observe players. Critical to that is not chasing the ball. What's going to happen the ball is going to find you. The ball will find you as the official everything will work out if you can grab it and it makes your game move along a little quicker that's great but number one priority is observing players at all times.